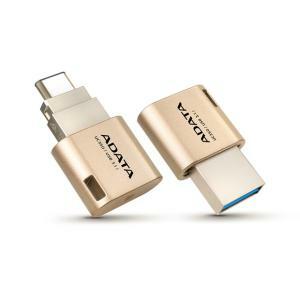 The ADATA UC350 32 GB USB 3.1 Type-C Flash Drive - Golden is the new-generation, dual standard connector which brings you major steps forward in data convenience and performance. It's USB 3.1 for the fastest transmission speeds, and even better, built with both a regular USB connector and a reversible USB Type-C plug for instant connections minus the guesswork. The UC350 works with MacBooks, PCs, iOS and Android devices for true universal access.